Acrylics Anonymous, Issue #078 -- Happy Happy, Joy Joy. 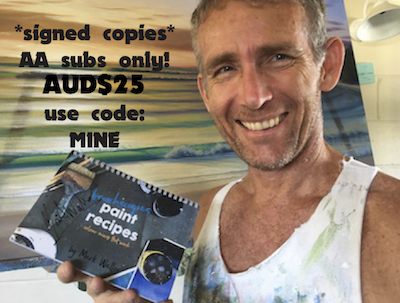 Signed Copies of our Beachscapes Recipe Book! Exclusive to you, first 50 only. 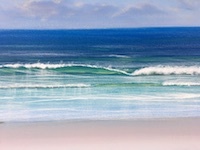 When painting whitewash, paint the brightest part of the wave when the brush is fully loaded with paint, and come down into the shadow areas as the paint diminishes on your brush. Simple impact to create easy volume. Remember your Micador discount is still valid! Use the code of WALLER20 to receive 20% off! 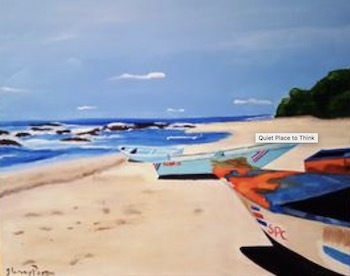 This month we're featuring Glendora from Chesterfield, Montana with the work titled "Quiet Place to Think". Awesome use of perspective and such a strong composition in this piece. Great job Glendora! 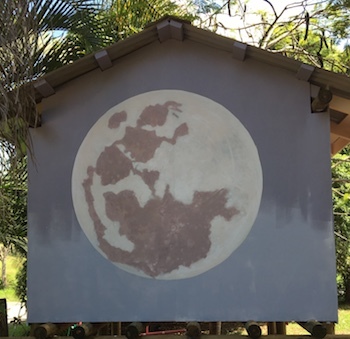 Click here to read more about Glendora's painting "Quiet Place To Think"
Pier Paolo Spinazzè aka Cibo (Italian for “food”) is an Italian street artist fighting hate crime with paintings of food. Check him out right here! Have you heard of the Daily Overview? Benjamin Grant founded this project which showcases our planet through stunning satellite imagery. Go exploring through these images and delight in our wondrous planet! These beautiful images will amaze you! This month's submission comes from yours truly, Frankie Sharman. I don’t make too much time to paint these days what with lots of other things taking up my time, but when my husband and kids planned to build a cubby/tween shack, I immediately volunteered to paint it. The kids chose sides and designs, and we got to work. I’ll just showcase the “elephant side” this time, as it was by far the most difficult and time consuming! 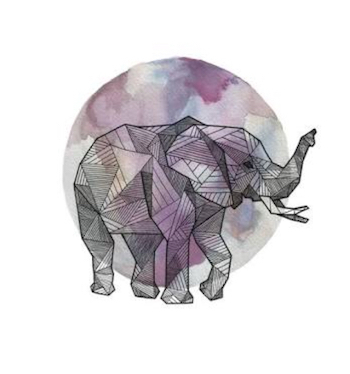 My eldest daughter is an elephant nut, and loves all things elephants, particularly the geometric styled elephants. 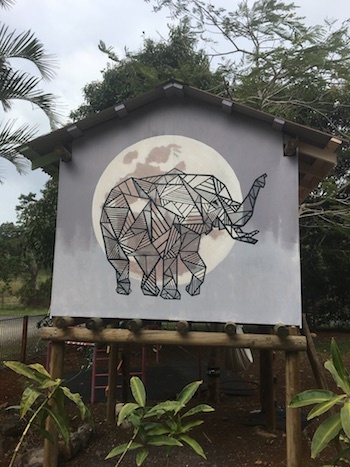 I found this great geometrical zentangle style elephant image online and contacted the original artist to see if she minded me painting it on the side of our cubby house. I didn’t hear back from her so I assumed she was happy about it! 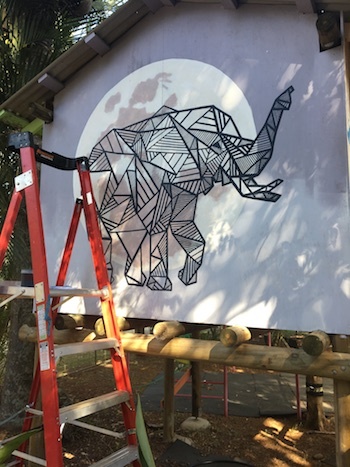 A design this size required a bit of planning (the wall height is almost 2 metres square, and it stands 1.5metres off the ground), and included borrowing the primary school’s dodgy old overhead projector to project the elephant design onto the wall. I considered drawing it freehand but really wanted to get the proportions of the elephant correct! But first things first, I wanted a full moon in the background, just because! 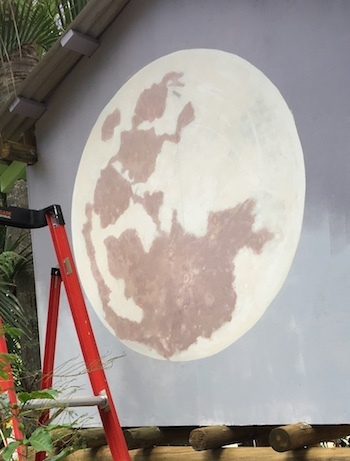 I bought the primary colours in exterior grade housepaint because I know it will last in our harsh Aussie conditions (from other outside house painting projects), and I spent a fair bit of time mixing colours to try and get them right. 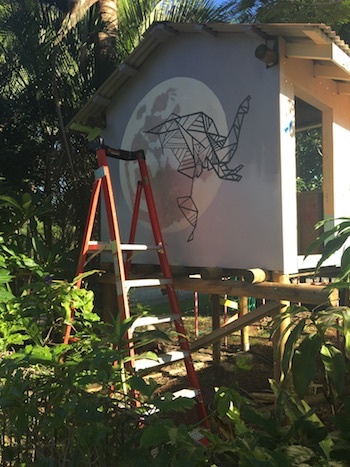 So then as mentioned, I borrowed the local school’s dodgy overhead to project the image onto the wall, which needed to be done at night, and included dodging heaps of crazy huge insects that were attracted to the light. I also battled the mozzies and my own fears of small creatures walking in front of the light which then projected hugely onto the wall, giving me multiple heart attacks thinking a giant locust plague was descending on me or something! Many many hours and hundreds of lines later and we have the finished product! I’m really happy with how it looks - it has a lot of impact, but more importantly, my daughter is happy with it! I’m really happy that I took the time to paint all those lines! Whew! Hoping you have the most wonderful holiday season and spend it sharing kindness and light with your family and friends. We'll see you again in early February 2019! !